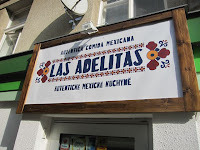 Three months ago, I wrote about the Mexican food delivery service, Las Adelitas. It was a mixed bag, and normally, I wouldn't revisit something so quickly. They had a few varieties of margaritas. First, I tried the classic (89 CZK) without salt. It was tiny, but I really liked it. The drink was both very tart, sweet, and packed a little punch. Unfortunately, it was gone all too fast. I know tequila isn't cheap, but the price seemed high for how small it was. I also tried the mango margarita (99 CZK). 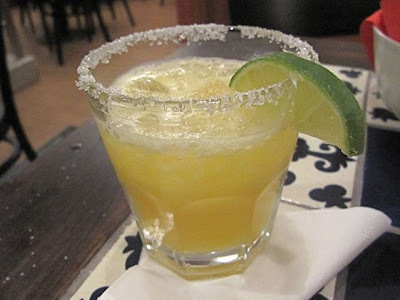 There was sweet mango nectar and tequila in a glass rimmed with sugar instead of salt. 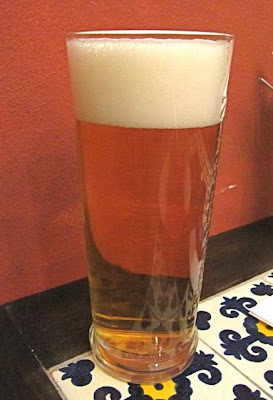 There was also more liquid in the glass than with the classic. It was good, but you really have to like sugary drinks. 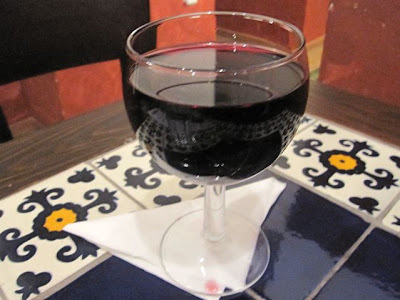 V tried a glass of red wine (29 CZK). She said it was fine, nothing special, but she couldn't believe the price. A real bargain. She even told the waiter they should charge more. On my first visit, I looked at the menu and saw that there really aren't any offerings that could be called appetizers or starters. 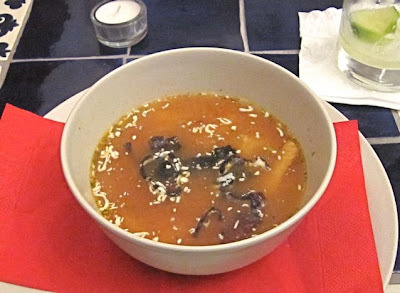 The only thing that comes close is the Sopa Azteca (49 CZK). The salty-sour broth contained shredded chicken tortillas, white cheese (Balkan style, the only thing close to a Mexican cheese), and dried red chilis that were quite chewy. Yes, it was spicy, but not overly so, even when I chomped on those peppers. The chicken was fresh and tender. I'd get it again. Then, I ordered my favorite dish at Prague's other real Mexican spot, Fosil. That would be the Tacos Al Pastor (169 CZK). You get three soft corn tortillas filled with chunks of pork marinated in Pastor chili sauce. I admit I was dubious about the combination of fresh pineapple, onion, and cilantro before I had it the first time. But it is quite delicious. My regrets with this version were that the meat was tough, it was barely warm, and they don't have the great hot sauces on the side that Fosil has. 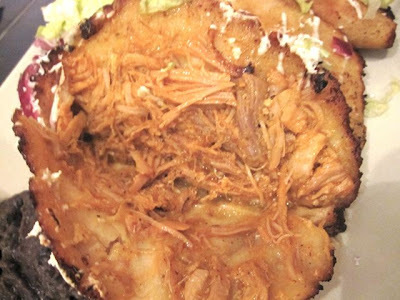 Pineapple juice is supposed to break down the protein and make the pork tender, but it didn't happen here. Still, I'd say it was my favorite of all the dishes I tried. 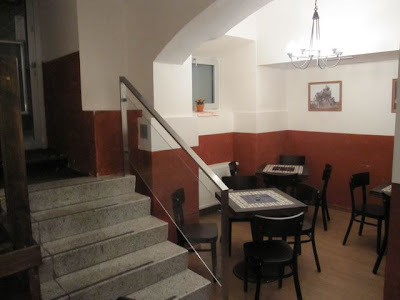 On my next visit, I had the Burrito de Cochinita with pork (145 CZK). 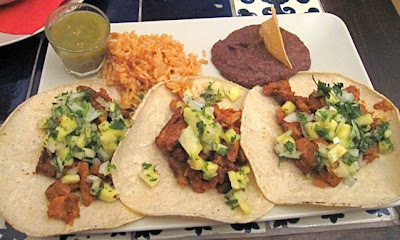 The meat was marinated with achiote, which is usually a paste of annato, coriander and cumin seeds, with black pepper and oregano. The pork was succulent and tender, with lots of flavor. I enjoyed the black beans inside. What I didn't love so much was the leaves of iceburg lettuce wrapped up in there. I asked the waiter if that was how they did it in Mexico. He said no -- that it was usually served outside the burrito, but they put it inside to cater to local tastes. Too bad. It would be better without. On the side was a green chili sauce, red rice, and black beans. 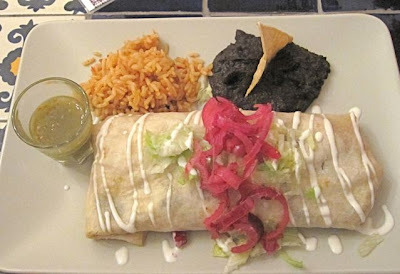 The burrito also had lovely vinegared red onions on top. 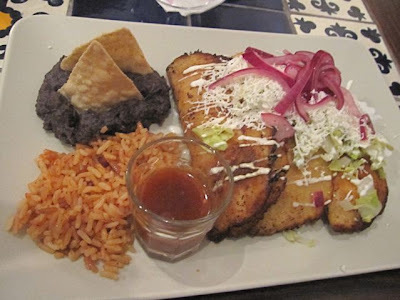 On my last visit with V, I ordered the Enchiladas (169 CZK). They offer a green sauce and a red sauce, but I got the mole. This one was sweeter than some I've had. It was thick, spicy, and yes, just a little bit like a chocolate sauce. It was less weird than you think, but I like sweet and savory dinner dishes more than most people. 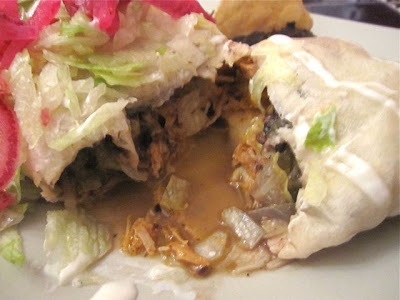 On the other hand, the chicken inside the rolled corn tortillas was too bland and a little dry. V tried the Quesadillas Adelitas (169 CZK). There were three varieties -- pork, chicken or vegetarian, but you can get one of each, which is what she did. These were not quesadillas like any I had had before. First, two didn't have cheese as far as I could tell. 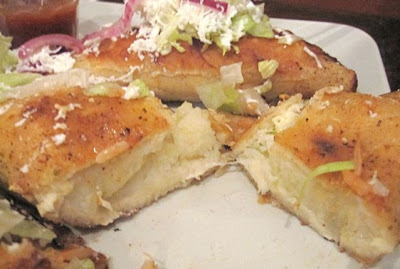 Second, they were like fried corn meal turnovers, rather than the pan-fried tortillas I'm used to. They were topped with onions and Balkan-style cheese. Again, the pork was the best, with the most flavor. Again, the chicken was dry and bland. And the vegetarian was filled with just mashed potato and cheese. It really was not tasty or interesting at all. Just greasy and heavy. Being from New York, it reminded me of a knish, if that means anything to you. 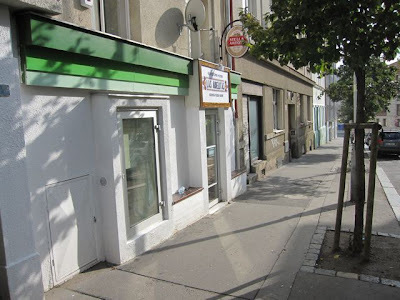 The service was always quick and very friendly. The waiter and manager always walked around the small place, asking people how they liked their food, getting feedback and having short conversations. Lots of smiles. That's very different from the service at Fosil. 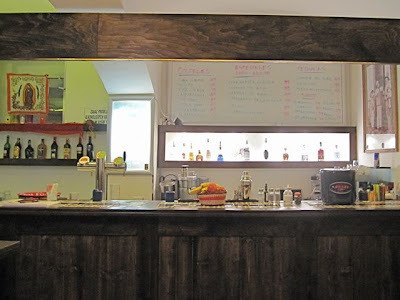 I like the Fosil's food, but the glacial pace and forgetfulness of the service often dissuade me from making a visit. 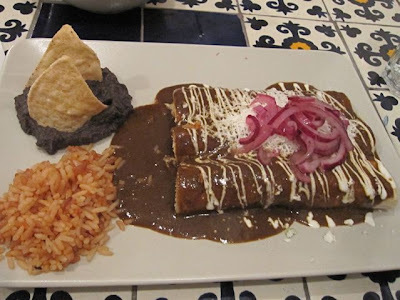 Las Adelitas Restaurant had many of the same dishes as their delivery service, with a few nice additions. The dining area was too bright for my taste. 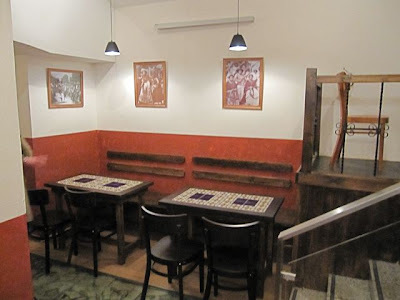 They played good Mexican music, but ambiance was somewhat lacking. I've heard they are going to work on that. I'd go back again, and I'd order anything, as long as it was anything made with pork. 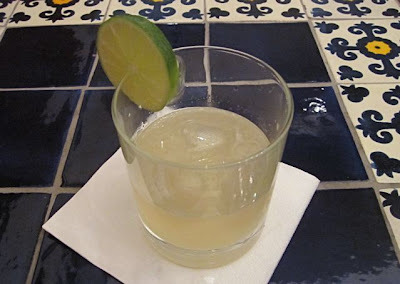 And if you read my earlier Las Adelitas review, it's like deja vu all over again. I was going to read this review, but then I saw "Las Adelitas" stocks Stella Artois. I can't be bothered with going to any place that has such a total disregard for quality. Not your fault, mind you, at least you DID complain of the fact.